Airtrim is a heat/moisture exchanger that uses the moist and warmth from the exhaled air. While inhaling the filter warms the air and protect your airways from the cold. 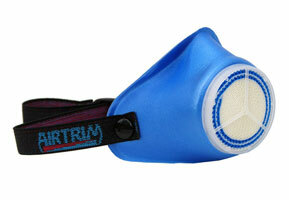 Airtrim breathing mask is made of molded foam that covers both nose and mouth. Therefore Airtrim is extra comfortable and warming compared to other heat exchangers. 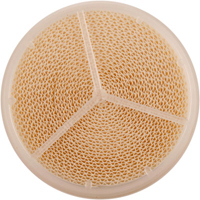 The filter becomes wet during continues use, for your comfort it is recommended to once in awhile blow the moist off with a sharp exhalation. Wet filters are fragile. The mask and filters should always air-dry after use. Airtrim works also very well for training in ski tunnels where the air often is very dry. Med Airtrim andningsmask levereras två filter. Ett sportfilter som lämpar sig särskilt för vinterträning och ett racingfilter med lägre luftmotstånd som lämpar sig för hårdare träning. Airtrim finns även med astmafilter som lämpar sig för personer som har särskilt svårt med kyla, till exempel personer med astma, kol eller kärlkramp. The temperature was measured 1 cm inside and 1 cm outside the filter. The measurements were made on a volunteer in a room with a temperature of -22°C and -10°C. We have unfortunately no test results from using racing filters. 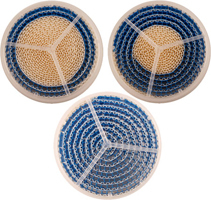 However, the lower air resistance normally gives a lower inhaling temperature than the sport filter. The measurements were made at the Arbetslivsinstitutet in Solna, Sweden. When your throat feels dry or sore you can use Airtrim even indoors. Use the asthma filter and the warm and humid breathing air will help you get better faster.